Balmoral Grist Mill is a living museum that still grinds and sifts buckwheat and oats with a water wheel, just like it did when the mill was built in 1874. It makes a great side trip from Tatamagouche or Truro. Taste oats after they’ve been toasted on the cast-iron floor of the kiln. Then watch the series of gears and pulleys turn the Scottish granite millstones that grind the grains. 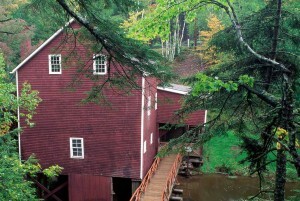 The mill is set in a beautiful wooded gorge. There’s plenty of space for kids to run around, a short hiking trail and picnic tables. Bring a lunch and make an afternoon of it. On your way out, you can buy flour and baked goods from the small gift shop. Directions: Route 256 leads to the mill, just off Route 311 between Truro and Tatamagouche. From Pictou, take Route 6 west, then go south on Route 326 and west on Route 256. Admission fees: $7.50 for a family or $3.25 for adults. Children under 5 years old and seniors get in free.